I am giving a lecture and demonstration at next year's Glass Art Society conference, to take place March 29, 2019 in St Petersburg Florida. In the summer of 2007, I attended a course given by Martin Rosol and Jiri Harcuba at The Studio of The Corning Museum of Glass in Corning, New York. While at Corning, I lectured about and demonstrated the "Black Art" of optical contacting. I was surprised that so many people were interested in this process. Not only the teachers and tutorial assistants, but also students of other glass disciplines attended. All were quite amazed. I did not think it would be interesting to other people. 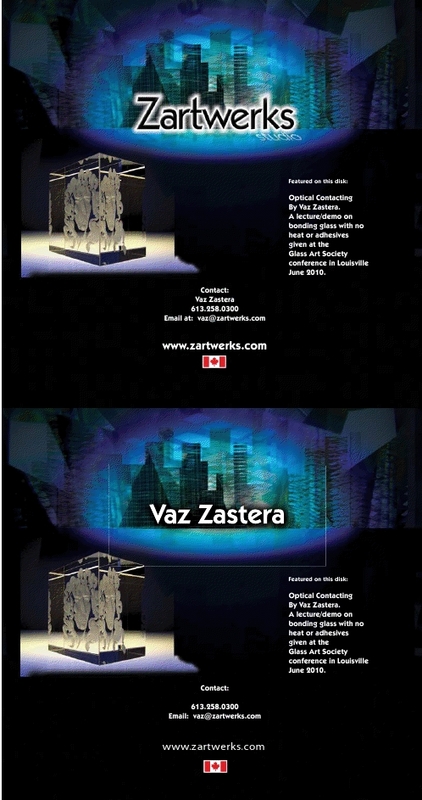 I have been optically contacting for 20 years and had become very familiar with the process. For days after my demonstration, the buzz around Corning was about "a magician" who can stick glass together permanently at room temperature without glue or heat. Jiri asked if it was possible to optically contact a piece of glass over top of an engraving which would eliminate the problem of having glue run into the hollows created by the engraving. Jiri engraved a piece of polished glass and I did the cold working and contacting. The piece was spectacular! 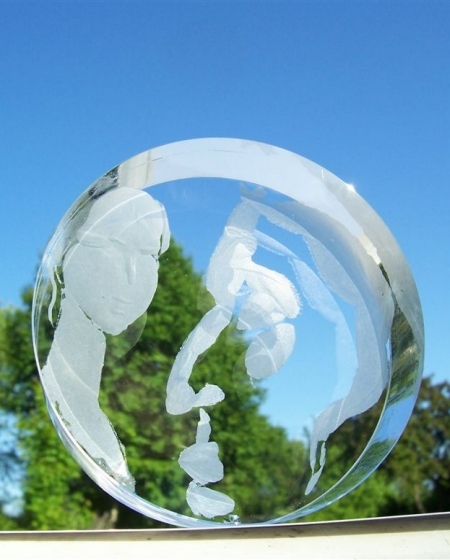 Please see my photos for the picture of "Suzannah" which looks like one piece of solid glass with an engraving floating inside. 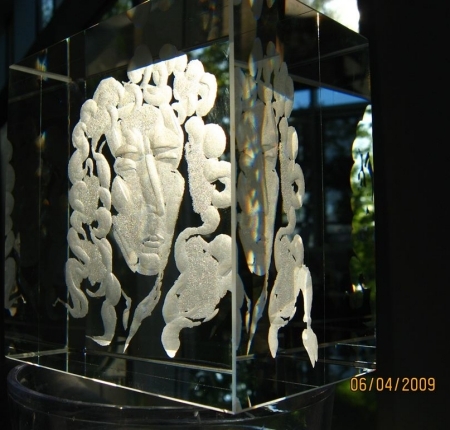 I have continued to work with Jiri on other engraved, optically contacted pieces. 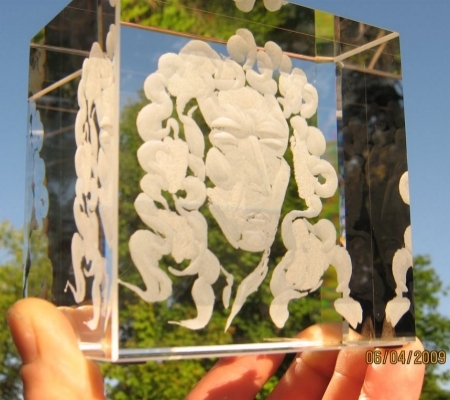 We have collaborated on an engraving of Sir Isaac Newton who was one of the first to observe this phenomenon and I have also optically contacted a multi layer piece that Jiri engraved with different engravings between each layer. I will be giving this Lecture/demonstration at the Glass Art Society 40th Annual Conference June 10-12, 2010 in Louisville, Kentucky. My demonstration will be about the process and technique of Optical Contacting glass. 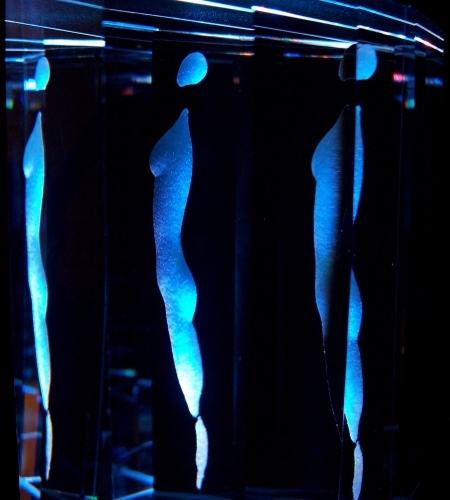 This is a process that I employ daily in my "day job" and I have begun to incorporate this technique into my cold glass sculptures. This "Black Art", although several centuries old, is not a mainstream technique in the glass art world. I will discuss the history of the technique and describe the process of preparing the glass and environment. 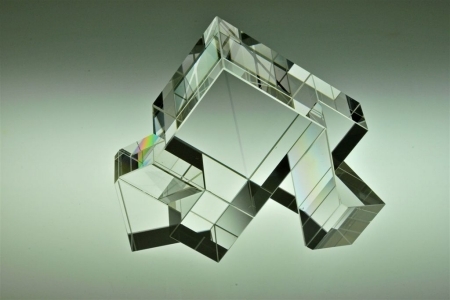 I will then give a detailed demonstration and optically contact pieces of glass together. 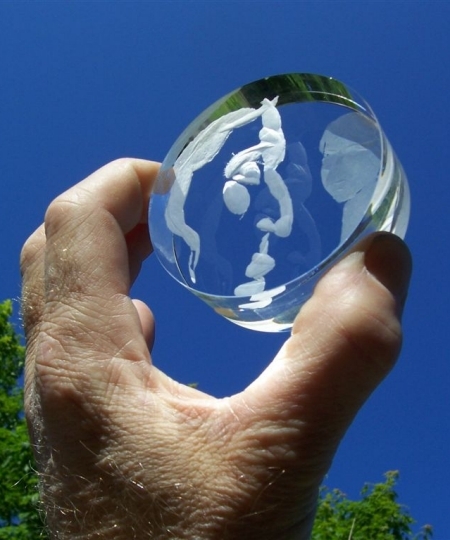 I will discuss how to cold work the glass so it can be optically contacted and finally, the application of this technique for the glass artist. Optical contacting is a process by which two surfaces are adhered at room temperature through molecular attraction without the use of adhesives. It is a procedure used primarily in a precision optical shop. This process is necessary when specifications call for very tight tolerances, very accurate angles, or the parts have to be polished parallel to a few arc seconds. This special method is also used to eliminate the dimensional uncertainty of wax or when adhesives cannot be used. The technique requires skillful polishing, a very clean environment, and unlimited patience. Optical contacting involves polishing the parts extremely flat on the sides to be contacted then cleaning the surfaces of the glass to an exceptionally high degree. The optician then brings the two surfaces together, and they literally bond to each other on a molecular level and become one. Optical contacting is a skill and like any art, one only becomes proficient with practice. Once the 2 sides of the glass piece are polished extremely flat, the parts are first cleaned with a very fine polishing compound applied on a folded up tissue then rinsed with water. Next the parts must be thoroughly cleaned with laboratory grade acetone followed by a cleaning with fresh methanol. A soft lint-free cloth or lint free tissue carries the cleaning solvents. Each surface to be contacted is cleaned, following that, the work piece surfaces are brushed dust free with a camel hairbrush or blown off with compressed dry air or nitrogen. For best results when contacting, a filter type clean bench with a fan should be used so that filtered air is constantly flowing across the work area. The pieces are then placed on top of each other and must be able to move freely back and forth without getting hung up. They should freely float on the entrapped cushion of air like a puck on an air hockey table. If there is even the slightest resistance, the contact surfaces are not clean enough and should be re-cleaned before proceeding. While the 2 pieces can still be moved, they are moved into the desired position. A light pressure is then applied to the top piece so that the entrapped air is forced out. This causes the interference fringes on the flat surfaces to move towards absolute zero in separation and a white color appears uniformly over the surface. The actual contacting takes place when further constant pressure is applied. You are able to see the white coloration suddenly change where the greatest pressure is applied and piece can no longer be moved. Once the contacting process has begun, and especially when the contact surfaces are truly clean, it will continue to contact across the entire piece without further external pressure. Frequently, however, it is necessary to assist the process with light but constant pressure. In the past, an optical contact that was not very strong could be easily broken. Today, however, variations on traditional optical contacting processes can create precise, optically transparent bonds that are robust and mechanically strong. These improved processes results in a bond that is as strong as if the entire piece had been made from a single piece of material. 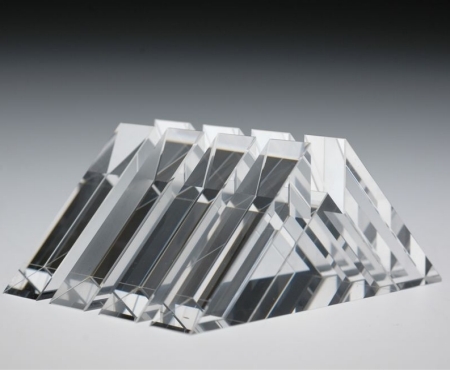 The union is chemically resistant and can be used with a wide variety of materials; both similar and dissimilar crystals and glasses can be bonded. Almost all these improved optical contacting processes use a variety of techniques which include an extra step to create stronger intermolecular bonds across the surface and creates a significantly stronger bond than those formed using the traditional optical contacting process. This extra step can include increased pressure, chemical activation thermal cycling and/or use of a vacuum chamber. Modern day uses of this improved optical contacting include composite high-power laser optics, micro-optics, cryogenic optics, aerospace optics, underwater optics and of course, art. The intermolecular forces that come into play include various modes of van der Waals force that exist for all material in close proximity. The magnitude of the force between these two solid bodies is a function of the separation distance and surface area. Optical contacting can be easily learned with practice. It is the highly developed knowledge and skills of the optician in grinding and polishing the glass to the highest levels of flatness and cleanliness that is the biggest challenge in mastering this technique. I look forward to sharing this little-known technique with other glass artists at the conference and hope that I can bring a bit of "Black Art" into the glass art world. was used to assemble 'Dove'. This is a first of its kind instrument for Boston University and NASA. It is called a "Monolithic Achromatic Nulling Interference Coronagraph" (MANIC). It will be used in a telescope system to block (null) out suns when observing exoplanets (planets orbiting a star other than our Sun.) It is all optically contacted.